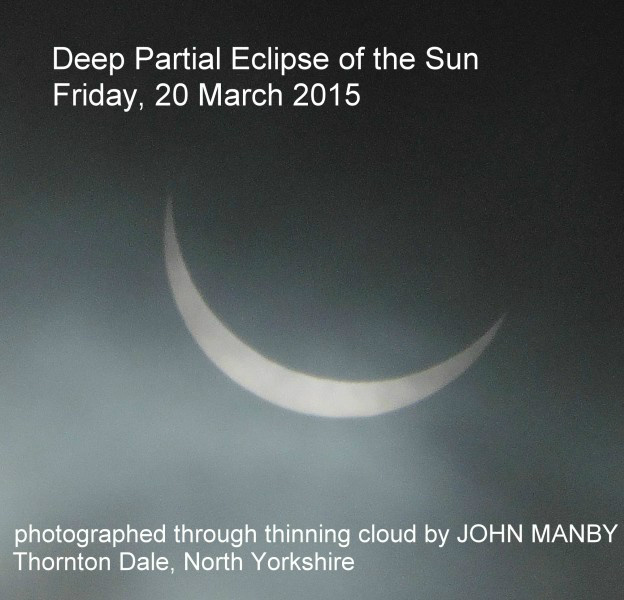 John's Image was made at 09h 30, just 5 minutes before maximum partiality, as seen from his site. Thank you John! This is one of the best deep partial eclipses visible from the UK since August 1999, which you will remember was total in the SW corner of the UK. The shadow of the moon travels mostly north-west-wards along the north Atlantic, the Norwegian Sea and on towards the North Pole via the Arctic Ocean. There are two landfalls only and these are the Faroe Islands and the sparsely inhabited Norwegian Svalbard Islands. Interestingly the shadow of the moon leaves the earth in the vicinity of the North Pole as the sun is touching the horizon, having just risen after the long Arctic night. The reason for this is that although the Equinox does not take place until 13 hours later, when theoretically the sun’s disc should be only half visible, refraction in the earth’s atmosphere causes the entire disc to be seen. Unfortunately at this time of the year, cloud cover tends to be at its worst over the areas of totality. From Scarborough the eclipse begins at 08h29, when a small notch on the upper limb of the sun marks the appearance of the New Moon as it begins its crossing of the sun’s disc. The maximum phase is at 09h35, at which time the sun’s altitude in the SE is 28°. At this time, over 90% of the sun’s diameter will be hidden by the moon, and so observing the sun using the proper techniques of projection and special astronomical filters will allow you to see the sun at that moment as a thin crescent ‘lying on its back’. The appearance from Scarborough is as good, if not better than, the August 11th eclipse of 1999. The moon continues its eastward journey across the sun and leaves the solar disc at 10h44. NEXT SOLAR ECLIPSE VISIBLE FROM SCARBOROUGH: June 10th, 2021. 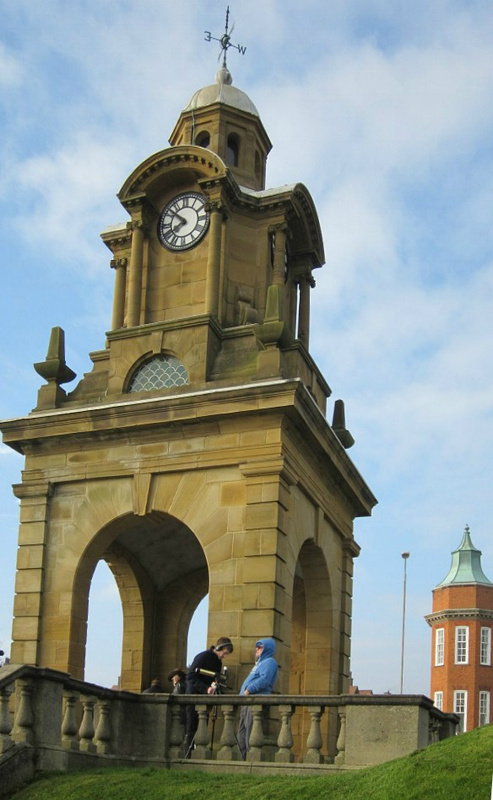 The Scarborough venue ( Shuttleworth Clock Tower) for public observing of the deep,partial eclipse of March 20th 2015. John with a BBC Radio York presenter.